How do we become great at sales? The stock answer is there’s the natural aptitude we’re born with and the knowledge and experiences we gain over time. And, of course, our drive to succeed. Here’s the story someone whose first job was at a bakery in college, and how with grit and determination she rose to become senior vice president for business development at a major multi-channel marketing platform company. 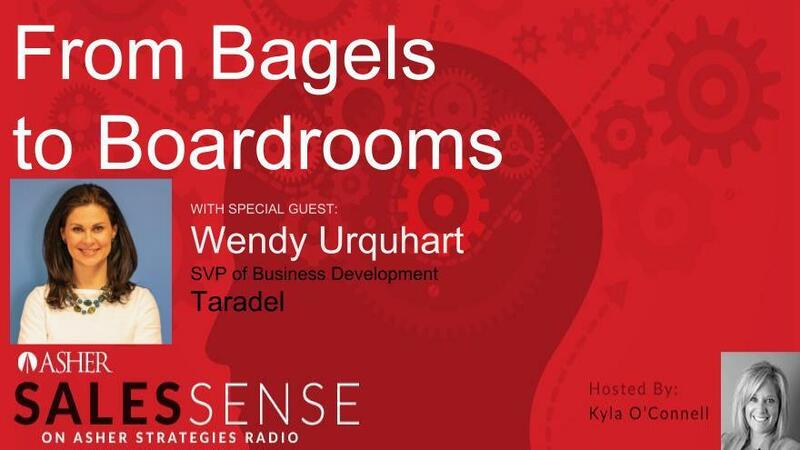 The March 21 Asher Sales Sense podcast with host Kyla O’Connell features guest Wendy Urquhart in “From Bagels to Boardrooms: My Personal Journey in Business Development". Hear what Wendy learned about sales from the bagel business, how she graduated from the “School of Hard Knocks” by selling telecom in the 1990s, and over time gained the confidence and expertise to lead a successful and growing sales team in the tough and competitive IT marketplace. Wendy will share key insights on how you, too, can grow your sales and build your sales career. designed to help their businesses grow. For the past ten years, Wendy has worked for Taradel, a platform that integrates direct mail and digital marketing for small businesses. She spends most of her time developing relationships with national brands and strategic accounts as part of the company’s “white label” strategy, currently used by brands including Staples, FedEx Office, Canada Post and the United States Postal Service. She resides in Richmond, Virginia with her husband and their two daughters.